Hi Jeff and Lori! Thanks for asking about our stay. .Check in was quick and painless.....(which I was personally thankful for because we were all hot, tired and looked a mess after 20 hours of driving.) We filled out a short form, paid our balance on the house and our requested discount tickets and we were handed our directions and our key. Thats it! We were on our way to a hot shower and a good meal within 10 minutes. The house not only met our needs, but actually exceeded our expectations! The house was very clean and beautiful, and it was spacious enough to accommodate our large group with room to spare! Everything that we needed was already there and all we had to buy was a few groceries. We couldnt have asked for anything more. The kids had a blast in the pool, but for the adults it was too cold to swim in. The next time that we go were definitely getting the pool heated. We didnt think that wed need the pool heated in May, but well know for next time. LOL Well never stay in a hotel again. It was nice to be able to save money on lodging, avoid the expense of eating out, and not have to step all over each other in a cramped hotel room. Well definitely stay with you again next year! Thanks! PS...do you have any homes in areas other than Orlando? lance, just wanted to drop you a line and let you know we had a great time on our vacation and the kids loved the pool. our 3 year old twins were scared of the water last year but they sure arent now! 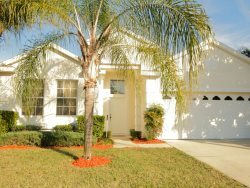 we would like to see if you have any rentals s/eof kissimmee as we had such a great time we are planning a trip for april 2005 and maybe a little longer! just drop us a e-mail. Greetings, We had a wonderful time on our trip to Orlando Jan 13-16. The home was wonderful. Very clean and lots of room. It was furnished beautifully. Thanks so much for the great home! I thought I noticed that you may be looking for "agents" in the KC area. If so, I would be interested in knowing more about what that means. I have referred two groups to your "Dream Homes" for their upcoming vacations. Again, thanks for the excellent facilities. Thanks so VERY MUCH for helping with my family vacation. You and your co workers are the GREATEST! We had a wonderful time & the accommodations were perfect for our family. Weve already shared the info with others & will continue to do so. Just a THANK YOU for such a wonderful home we occupied last week at the Emerald Island Resort. The children loved the pool. Our family loved it sooo much that we are talking about coming back next year to see the sites we did not get to see this trip. Of course we will contact Dream Homes for accommodations. Again thanks for such a beautiful home. Just wanted to send you a note of thanks for providing a very nice and very clean house for our recent vacation. It was everything we had hoped for and more. Although we rented a four bedroom / two bath house, you provided us with a five bedroom / three bath house; this was very much appreciated as our extended family consisted of five adults and two children. And now a bit of an apology. When we checked in, the office was open so I did not have to use the lock box. When we were leaving, it was very early in the morning and the office was closed. I did not realize that we had to use the lock box to return the keys; I thought it was a key drop. Well, anyway, I did not have the code so I was forced to wedge the keys between the entrance doors. Sorry for having to do that but we had to rush our daughter to the airport. Hopefully this was no problem. (You may want to consider a true key drop arrangement for key returns rather than the lock box......I cant believe that I would have been the only person with this same situation) Once again, thanks for making our stay in Kissimmee and our vacation at Disney an enjoyable experience. Thank you for replying to my email, but your exceptional customer service has already replied to me and the issue has been taken care of . I gladly made my reservation with dream home and reccomended you to my friends. Your manager is truly a class act and she should be commended. Thanks again and I look foward to my vacation with dream homes. Hello! My name is Paula Lopez I just came back from Kissimi,Irented a house in eagle piont (#1022) AND I LOVED IT VERY MUCH. I will like to rent another house with 4 bedrooms from june 2 to june 4 please tell me the prize;I remember that you told me that you had one for $115 per day. tell me the diference in prize for a 5 bedroom. And please make sure that I can pay you with Diners Club International. thank you for your help!!! Hi Lance, This is Mike Mullin. We are currently checking out of house 539 Eagle Point South. First of all we have enjoyed are stay very much!! So much so that I would like to cancel the Hotel Reservations that I have for Wenesday May 10th, Thursday May 11th and Friday May 12th in hopes of renting another home from you for those days When I checked out this morning I gave them the information: I am intersted in a 3 or 4 bedroom with pool heating for Wed-Friday next week. May 10,11 and 12th.Please call/leave a message on my cell phone as I dont know if I will have access to email on the rest of out trip to southern Florida. Please let me know as soon as possible so that I can cancel my hotel reservations!! Thanks!! Rex Alexander I had a wonderful vacation summer thanks to you and your lovely houses. We really appreciate what you did for us. Thanks for the service we had at the office. That was the best vacation I ever had with my family and friends. Thank you. Hello Lance/Michelle... we just got back from Orlando yesterday...the house was GREAT!...we were all very impressed. I was writing to make sure that the key was returned(we left EARLY on Tuesday morning) and to possible look into becoming a DREAM HOMES rental agent. Ill be calling Lance sometime soon to get more information. Thank you all very much for everything! Vanessa Pollard Administrative/Marketing Assistant Historical Arts & Casting, Inc.